The French site of the Euromillions lottery has been hacked, with the homepage replaced by a passage from the Koran condemning gambling. The hackers, calling themselves "Moroccanghosts", posted the message in Arabic and French. The Koranic verses call games of chance and alcohol "works of the devil" intended to turn people away from God. The Francaise des Jeux (FDJ) company, which runs Euromillions in France, said its other games were not affected. The message appeared on the site late on Sunday morning, according to French media reports. The site was still unavailable on Sunday evening, although the religious message no longer appeared. FDJ said in a statement that the pages concerned were in "the process of being put back up". It added that none of its games had been compromised by the attack, and neither had any data. 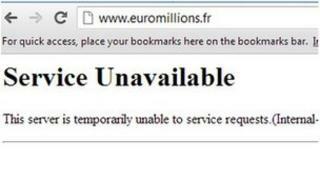 However, FDJ's corporate pages were also inaccessible on Sunday evening, with users told it was "unavailable due to service requests", the same message as now appears on the euromillions.fr site. The Euromillions lottery is played in nine European countries.